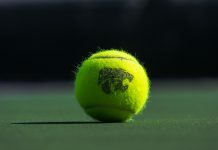 The Kansas State tennis team won both matches on Saturday during their home opener, in dominating fashion, sweeping South Dakota and University of Missouri-Kansas City. The Wildcats rallied behind their No. 1 and No. 2 players, junior Carolina Costamagna and sophomore Millie Stretton, who both finished the day with victories in both singles and doubles play. The dynamic doubles duo of Costamagna and senior Palma Juhasz, and Stretton and sophomore Ana Garcia Navas also had no problems against South Dakota and the University of Missouri-Kansas City in the double header. The Wildcats managed to pick up their first two victories of the new year, starting with South Dakota on Saturday morning. The Wildcats were led by Costamagna, who has got off to a strong start thus far this season holding down the No. 1 spot. Costamagna had no trouble beating South Dakota sophomore Ellie Burns, winning 6-0, 6-4. Stretton lost the first set 1-6 in her singles match against South Dakota junior Barbora Kollarova. But Stretton was able to come back and win the next two sets to pick up her first singles win of the season. Juhasz, freshman Ines Mesquita and senior Livia Cirnu all recorded victories for the Wildcats during singles play as well. 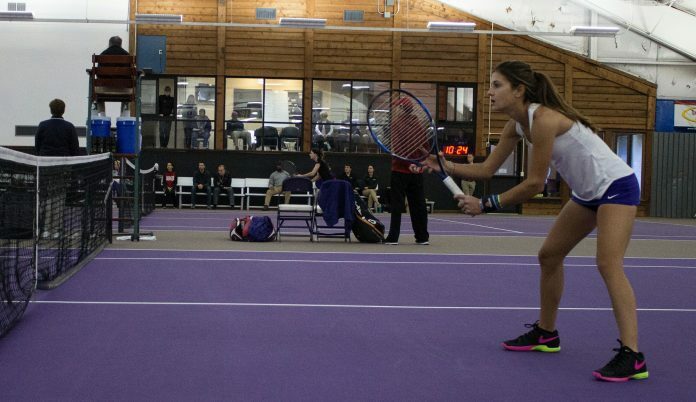 K-State also won all three doubles matches to complete the 7-0 sweep over the Coyotes. K-State kept their winning momentum going when they took on UMKC later Saturday afternoon. The doubles pairs again had no problems in their second match of the day, all three pairs won easily against the Roos. In singles play it was much of the same. Costamagna and Stretton at the No. 1 and 2 spots were both successful. Costamagna took down junior Melinda Johnson in two sets 6-3 and 6-0. Stretton defeated sophomore Katie Fries 6-4, 6-4. The young talent, sophomore Ana Garcia Navas, claimed her first singles victory of the 2017 season defeating junior Marina Albert 6-2 and 6-2. 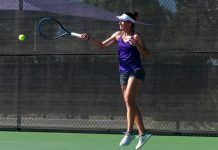 The Wildcats also enjoyed strong performances from the four, five and six spots by Cirnu, senior Iva Bago and senior Maria Panaite, who all added victories for K-State in the 7-0 win over UMKC. K-State will look to build off of Saturday’s dominant day hosting another double header Feb. 3 against Missouri State and the University of Connecticut. The action is set to hit-off at 10 a.m.